The lobby group had deferred a planned blockade of the N24 pending a meeting with the independent chair of the Tipp Town Task Force. 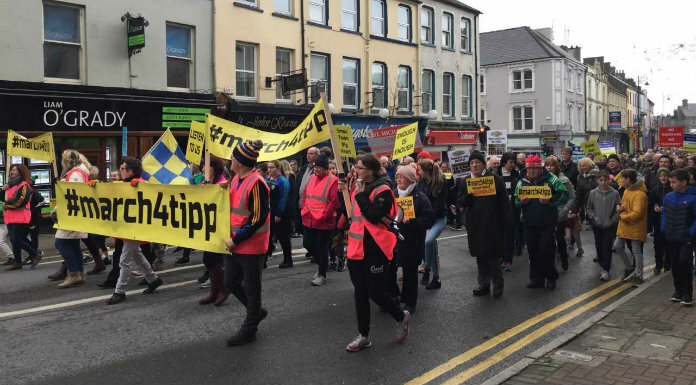 March4Tipp had planned to gridlock the main Limerick – Waterford road through Tipp Town to highlight their campaign to secure investment in the area. However this was put on hold following the appointment of Alison Harvey as independent chairperson of the Tipp Town Task Force. Following a meeting with Ms Harvey the March4Tipp group feel the process she will lead should bring some very positive and much-needed developments for the town. However, they are not convinced that the process can yield the more serious outcomes that are necessary to restore Tipp town economically. March4Tipp member Denis Mulhair says the process that has been described to them does not bring the State Agencies that can actually make decisions to the table. Another Group member, Katherina Ryan, said that a concern would be that the Government could “tick a box” by saying it had set up a task force for the town, when in reality it is not a task force at all.